Many applications, including Microsoft Word and OpenOffice Writer, add extra line spacing between each line of text, which creates white lines in 2D and stacked symbols. For 2D barcodes, use only the “IDAutomation2D” font; do not use “IDAutomation2D S” or “IDAutomation2D XS” fonts because these can cause extra spacing in some applications including Oracle XMLP reports. Set the line spacing to “1” or “Single” without any additional spacing before or after. If white lines still appear, set the spacing to less than 1, such as 0.98 as shown in the Crystal and FileMaker examples below. The spacing greater than 1 creates white lines. Choose the option to remove space after each paragraph. The additional space can create the white lines. 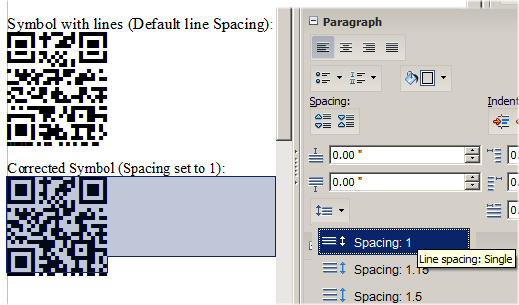 The line spacing property is not adjustable within Excel. A special 2D XLS Font for Excel is available to overcome the line spacing issue and it is compatible with many 2D fonts including QR-Code, Data Matrix and PDF417. Native Barcode Generator for Excel which creates barcodes as images in cells. 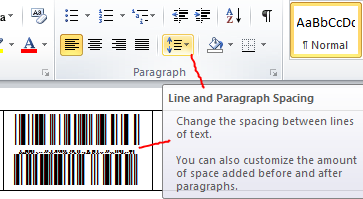 Microsoft Word to perform a mail-merge using the barcode column as the source. 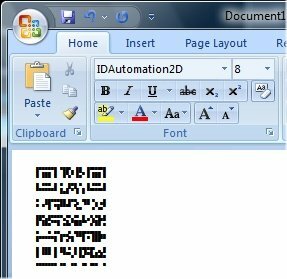 IDAutomation Barcode Label Software and connect to Excel as the data source. Stream barcode images into Excel; this is the most complex option and requires knowledge of VBA scripting. If this issue occurs with PCL fonts, reduce the VMI setting and refer to the pclinfo.html file in the appropriate font package for more information.